Sooran ka laddu is an unusual recipe of mithai. Even I heard of sooran ka laddu quite late but being in Banaras I wouldn't have stayed ignorant for long. 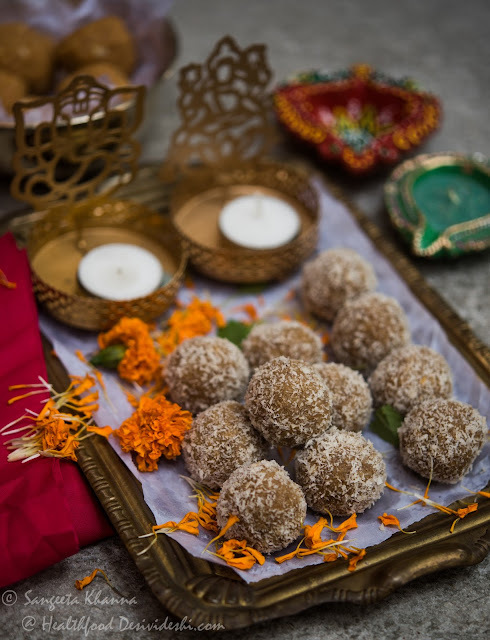 One or two tiny sooran ke laddu used to be served as part of the elaborate prasad in one of the temples in Banaras that my mother used to go and later I got to know that Sri Ram Bhandar would make sooran ke laddu every Diwali for their elite patrons. Note that Sri Ram Bhandar is the oldest known sweet shop in Banaras and it has been patronised by aristocrats for more than a century. Read more about it here. Sooran or zamikand is an underground corm that is used as a vegetable almost all over India. It is considered very good for gut health and several recipes like sooran ka chokha, sooran ki subzi, sooran ki chutney, sooran ke kabab and sooran ka achar are relished in eastern UP, Bihar, Jharkhand and even Bengal. Sooran ke kofte and sooran ka bhuna bharta is also made by several families. I had not seen this vegetable elsewhere till I tasted a dish called sooranache kaap in Maharshtra several years ago and then I understood how popular this vegetable is in other parts of the country too. More recently I tasted a recipe called senai kizangu poriyal in Tamilnadu too. Everyone seems to be liking sooran going by the way it is served with a little extra pomp. A native variety with several small bulbils on it's surface is quite tasty when cooked right. But the native sooran variety is very itchy while chopping it and even after cooking if it has not been cooked with proper method. It needs a lot of sour elements in the curry to neutralise the itchiness caused by oxalate crystals. 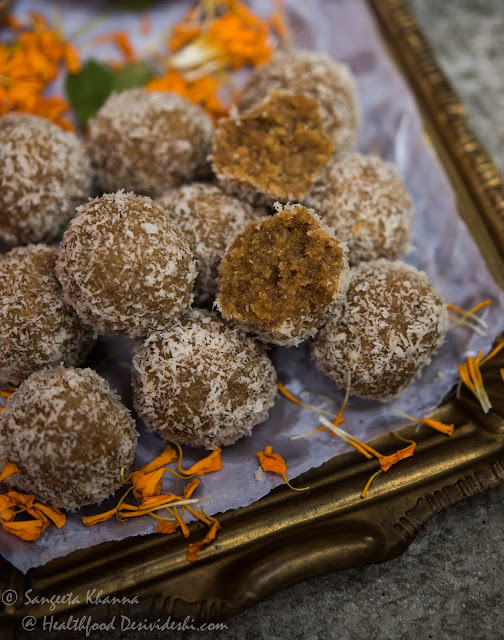 The smooth skin variety of sooran is called as Bambaiyya sooran in UP and is mildly itchy sometimes and that one is used to make this sooran ka laddu. I have used milk powder to make khoya for this recipe as getting pure khoya is not possible anymore. You can reduce milk to make khoya if you wish. Heat the ghee in a kadhai and add the grated sooran in it. Fry it in low flame till the grated suran turns brown and crisp. Strain the sooran with the help of a perforated spatula and crush it. you can blend it in the mixer if needed. In the same kadhai, in the remaining ghee, add the milk and milk powder together keeping the flame low, and cook till the mixture becomes khoya. Brown it lightly. Now add the crushed sooran and sugar or jaggery and bhuno a little more to combine. Add the desiccated coconut slowly to bring the mixture to a consistency that can be easily made into laddu. Cool a little and make laddus. Roll them in desiccated coconut and arrange in the container you are planning to store the laddus. These sooran ke laddu keep well at room temperature for 2 weeks. You don't really get to taste much of sooran in these laddus but it was a way of mithai loving Banarasis to eat sooran as a ritual on the day of Diwali. I hope you try this recipe this Diwali. I like the traditions not just because they make our festivals bright and happy, some of these involving food produce also have helped conserve a particular plant species too. Think about it, the way we are getting produce from all over the world, everything available round the year and the way food is dictated by fashions and trends, the rituals could revive the native flora in a fantastic way. Buy some sooran this Diwali and make sooran ka laddu.